Discover the artistry and technology of some of the most impressive arms and armour from across the globe and learn about they can provide a key to understanding world history. 19th-century pixiongjia (leather cuirass) from Sichuan, China. Brought back by a French missionary from south west China, in about 1920. View collection record for pixiongjia. 19th-century large round tengpai (rattan /cane shield) from China. Decorated with a painted tiger face. View collection reocrd for tengpai. 19th-century zhuge nu (repeating crossbow) from China. A bamboo and silver pump-action crossbow. View collection record for zhuge nu. 15th-century Ming dynasty jian (sword) from the workshop of the Yongle Ming Emperor. View collection record for Ming dynasty jian. 16th–18th-century Ming or early Qing dynasty iron gun from China. Acquired in Benin by an expeditionary force commanded by Lt. Col. Bruce Hamilton in 1897. View collection record for the iron gun. 19th-century mian jia (armour) from China. A uniform for an officer in the Imperial Guard. Highly decorative fabric coat and helmet in copper, silver and gold. View collection record for mian jia. 19th-century yanyue dao (glaive) from China. Blade is set with seven copper bosses connected with brass strips representing a constellation of stars. The blade extends from a socket in the shape of a dragon’s head through the mouth. View collection record for yanyue dao. The fabled treasures of China span thousands of years of history. From the exotic Silk Road to the mysterious Great Wall, China’s allure is as vast as the country itself. Here, Natasha Bennett introduces the fascinating world of Chinese arms and armour in the Royal Armouries’ collection. 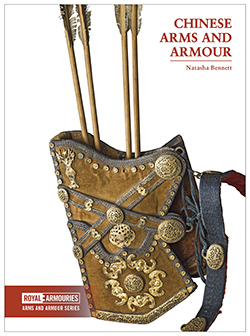 Offering a colourful insight into one of the world’s earliest civilisations, she chronicles the development of personal weapons and armour from the late Bronze Age to the early twentieth century. It is ideal for anyone interested in the military and material culture of this absorbing land. Pre-order now. Available for dispatch from 1st December.